To Cite: Sadeghi R , Irandoust K, Taheri M. The Effect of Spirulina Supplementation and Combined Aerobic-Strength Training on Serum Homocysteine of Sedentary Females, Asian J Sports Med. 2018 ; 9(4):e79628. doi: 10.5812/asjsm.79628. Background: The increasing rate of mortality due to cardiovascular disease has been reported in people with low physical activity worldwide. Objectives: The purpose of the present study was to investigate the effect of spirulina supplementation and combined aerobic-strength training on serum homocysteine of inactive females. Methods: It was a semi experimental study with pre and post-test design. The subjects consisted of 37 sedentary women who participated voluntarily in the study and were randomly divided into supplement; training and supplement+training groups. Measuring the study variables including serum homocysteine and anthropometry variables were done in pre-test and posttest phases. The data were analyzed using paired t test and ANOVA. 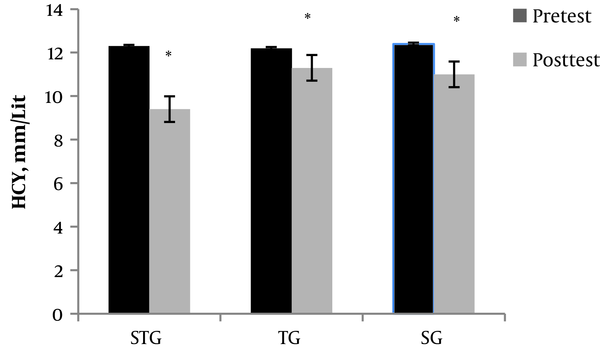 Results: The results suggested that spirulina supplementation and combined aerobic-strength training had a positive influence on serum homocysteine levels in sedentary women (P = 0.003, P = 0.04 respectively) with a greater influence by the combined effect of exercise and supplement (P = 0.001). Conclusions: The results indicate that homocysteine as an independent cardiovascular disease risk factor in sedentary women can be modified by spirulina and combined strength and aerobic exercise. The increasing rate of mortality due to cardiovascular disease has been reported in sedentary people worldwide (1, 2). In this regard, increased levels of homocysteine has been recognized as a risk factor for heart disease especially atherosclerosis. There are several studies reporting the association between cardiovascular morbidity, mortality and high homocysteine levels (3, 4). Considering the increased tendency to use supplements and preventive strategies such as exercise therapy to prevent cardiovascular disease, this has always been a concern for researchers. There is some evidence showing the positive effect of folic acid and vitamin B12 in decreasing the levels of homocysteine (5, 6). Research evidence suggests that aerobic exercise reduces cardiovascular disease by reducing LDL, cholesterol, triglyceride and improving HDL (7, 8). Along with the exercise therapy, the use of nutrient supplements has been extensively increased with the intention of health management. According to medical research, spirulina (rich in folate and B12) as a nutrient supplement has been widely consumed by humans for centuries to treat many health problems such as anemia, diabetes and cancer (9, 10). For the prevention of the complications caused by poor lifestyle and nutrition, researchers have always tried to find ways by which the problems such as cardiovascular ones can be attenuated (11). Considering the importance of taking vitamin B12 and folic acid in the prevention of cardiovascular disease, and the dispersal of these vitamins in foods consumed, it is necessary to use supplements that contain both vitamins. Furthermore, the vital role of exercise must be considered seriously in such a condition. Therefore, it was hypothesized that spirulina, which contains these two vitamins, can reduce homocysteine and improve the condition of the vascular system. The aim of this study was to investigate the effect of spirulina supplementation and combined aerobic-strength training on serum homocysteine of sedentary females. In this randomized controlled trial, with pre and post-test design, 37 sedentary women, lacking evidence of cardiovascular disease were enrolled voluntarily in the sporting club of Tehran Municipality Gyms (Region 11) in the year 2017. The research design can be seen in Figure 1. The inclusion criteria were also considered: having conditions for doing exercise on the basis of Physical Activity Readiness Questionnaire (PAR-Q); no use of medication that could interfere with the study's objective and percent body fat 25 - 30%. The subjects were randomly divided into three groups: Supplement+training group (STG) [51.5 ± 3.4 years]; training group (TG) [51.75 ± 2.35 years]; and supplement group (SG) [50.3 ± 2.87]. Although 37 subjects had been recruited originally, four subjects were excluded, so the final sample on which data analyses were performed included 34 adults. The groups receiving spirulina were given 500mg spirulina tablet (manufactured by SINA RIZ JOLBAK QESHM CO) for three months each day before lunch (12). Also included was 550 - 670 mg/g protein; 6 - 80mg/g fat; 20 - 60mg/g fiber; 06/0mg/g vitamin E; 06/0µg/g folic acid. Measuring serum homocysteine and anthropometry variables were done in pre-test and posttest phases. In order to evaluate the serum levels of homocysteine, the blood sample was taken from the venous vein 48 hours prior to the beginning of the protocol, at 8:00 in the morning while the subjects were in fasting condition for 12 hours. The post-test was performed 24 h following last session of training. Anthropometry variables including percent body fat (PBF), waist to hip ratio (WHR) and body mass index (BMI) were measured by body composition analyzer (Model Zeus, Korea) (13). The information of sleep-wake schedules were collected using the Pittsburgh Sleep Quality Index (PSQI) for a 3-day period before the experiment. Since the intake of micronutrients and macronutrients has a significant effect on blood test results, a 24-hour questionnaire (to control the subjects' nutrition) was used the day before the pre-test and post-test to control this factor. The N4 Nutrient Processing Software program was used to analyze the food intake. The training protocol included a three sessions a week supervised physical training (aerobic plus resistance exercise) lasted for 12 weeks. The first session was devoted to protocol familiarization. The exercise program consisted of warm-up, 30 min of aerobic along with the strength training. The aerobic training part was perfrormed with the intensity of 60 - 70% Max HR for 30 minutes. The strength part consisted of a 7-exercise circuit as follows: Leg press, bench press, lat pull down, seated rowing, shoulder press, abdominal curls, and knee curls (14). The exercise intensity was evaluated and controlled by Polar Electro, Kempele, Finland. The written consents were obtained. The study protocols and procedures were approved by the Ethics Committee of Imam Khomeini International University. The research was performed in accordance with the ethical standards of the Helsinki Declaration (1964). Kolmogorov Smirnov test was used to determine the data normality. The data were analyzed using paired t test and ANOVA. The physical characteristics of subjects are presented in Table 1. Paired t test suggested that both training+supplement and training groups had a significant improvement in BMI, WHR and BFP (P ≤ 0.05). BMI was decreased 6% in STG and TG groups in posttest. In WHR factors, STG and TG groups had 3% improvement in posttest. In addition, BFP had a significant decrease in both STG (11%) and TG groups (13%). The level of homocysteine is seen in Table 2. Abbreviations: SG, supplement group; STG, supplement+training group; TG, training group. 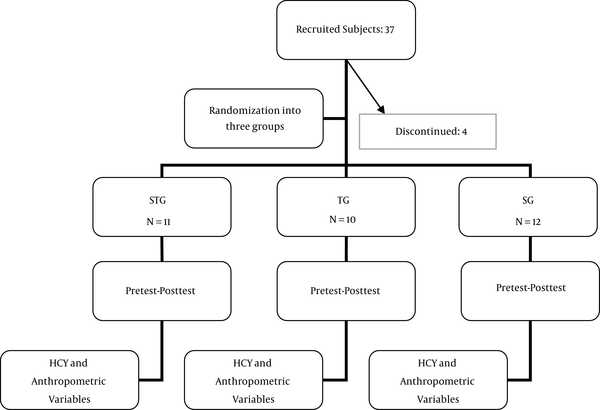 As shown in Table 3, the ANOVA test results suggested that there was a significant difference in homocysteine levels of groups after intervention (P = 0.033). It was suggested that there was a significant interaction between group and pre-test (F = 4.166; P = 0.015) and the main effect of group was significantly different (F = 9.16; P = 0.001). Figure 2. The effect of spirulina training on serum homocysteine after intervention. Abbreviations: HCY, homocysteine; SG, supplement group; STG, Supplement+training group; TG, training group. This study was conducted to investigate the effect of spirulina supplementation and combined aerobic-strength training on serum homocysteine levels of inactive females. As shown, homocysteine levels were significantly improved following all study interventions with a preference for STG group. One potential explanation for the finding of combined aerobic-strength groups refers to the improvement in BMI, WHR and BFP. Since it has been shown that there is a direct correlation between obesity and an increase in homocysteine levels, it is logical that reducing the percentage of fat improves homocysteine. Aerobic exercises increase the absorption of effective vitamins in the intestinal tract of the elderly, and by converting homocysteine to methionine and cysteine, prevent its accumulation in the bloodstream. Therefore, reducing homocysteine can attenuate the risk of cardiovascular disease. However, the result of the study by Gaum et al. was not consistent with our study. They studied male rats at a frequency of 5 days a week, each day from 20 minutes to one hour for 8 weeks. The difference in result may be due to the use of human specimens in the current research compared to animal samples and the lack of control of all conditions in our study. Regarding the positive effect of spirulina supplement, it can be stated that homocysteine levels can be lowered with spirulina. One limitation of the research was the low number of subjects, along with convenience sampling that limited the extent to which the results can be applied to middle-aged women in general. Additional studies involving more subjects, a more controlled environment with different varieties of psychological and physical tests are required in order to make conclusive assumptions about a larger population. The results indicate that homocysteine as an independent cardiovascular disease risk factor in sedentary women can be modified by spirulina and combined strength and aerobic exercise. We thank the participants who generously gave their time to the study. This research has been conducted as MS thesis in Imam Khomeini International University. Conflict of Interests: All authors declare that they have no conflict of interest and therefore have nothing to declare. Ethical Considerations: The study protocols and procedures were approved by the Ethics Committee of Imam Khomeini International University. 1. Sayyah M, Rahimi SM, Bigdeli M, Rajabi M. Comparing the anthropometric characteristics of injured and non-injured girl student athletes participating in the sport olympiads held by the ministry of health and medical education in the summer of 2009 in the city of Yazd. Biosci Biotechnol Res Asia. 2011;8(2):367-71. doi: 10.13005/bbra/875. 2. Amini M, Mirmoezzi M, Salmanpour M, Khorshidi D. Eight weeks of aerobic exercises improves the quality of life in healthy aged sedentary men. Int J Sport Stud Hlth. 2018;1(1). e67514. doi: 10.5812/intjssh.67514. 3. Marcus J, Sarnak MJ, Menon V. Homocysteine lowering and cardiovascular disease risk: Lost in translation. Can J Cardiol. 2007;23(9):707-10. [PubMed: 17622392]. [PubMed Central: PMC2651913]. 4. Refsum H, Smith AD, Ueland PM, Nexo E, Clarke R, McPartlin J, et al. Facts and recommendations about total homocysteine determinations: An expert opinion. Clin Chem. 2004;50(1):3-32. doi: 10.1373/clinchem.2003.021634. [PubMed: 14709635]. 5. Henry OR, Benghuzzi H, Taylor HA, Jr, Tucci M, Butler K, Jones L. Suppression of homocysteine levels by vitamin B12 and folates: Age and gender dependency in the Jackson heart study. Am J Med Sci. 2012;344(2):110-5. doi: 10.1097/MAJ.0b013e31823782a5. [PubMed: 22173042]. [PubMed Central: PMC3319471]. 6. Landgren F, Israelsson B, Lindgren A, Hultberg B, Andersson A, Brattstrom L. Plasma homocysteine in acute myocardial infarction: Homocysteine-lowering effect of folic acid. J Intern Med. 1995;237(4):381-8. [PubMed: 7714461]. 7. Paoli A, Pacelli QF, Moro T, Marcolin G, Neri M, Battaglia G, et al. Effects of high-intensity circuit training, low-intensity circuit training and endurance training on blood pressure and lipoproteins in middle-aged overweight men. Lipids Health Dis. 2013;12:131. doi: 10.1186/1476-511X-12-131. [PubMed: 24004639]. [PubMed Central: PMC3846819]. 8. Moghadasi M, Heidarnia E, Nematollahzadeh M, Torkfar A, Arvin H. Effect of 12 weeks high intensity aerobic exercise on serum oxidized ldl-c in obese middle aged men. Brazilian J Biomotricity. 2011;5(4). 9. Madhyastha HK, Radha KS, Sugiki M, Omura S, Maruyama M. Purification of c-phycocyanin from Spirulina fusiformis and its effect on the induction of urokinase-type plasminogen activator from calf pulmonary endothelial cells. Phytomedicine. 2006;13(8):564-9. doi: 10.1016/j.phymed.2005.09.006. [PubMed: 16920511]. 10. Ku CS, Yang Y, Park Y, Lee J. Health benefits of blue-green algae: Prevention of cardiovascular disease and nonalcoholic fatty liver disease. J Med Food. 2013;16(2):103-11. doi: 10.1089/jmf.2012.2468. [PubMed: 23402636]. [PubMed Central: PMC3576896]. 11. Rodrigues-Rodrigues T, Gomes ACV, Neto GR. Nutritional status and eating habits of professors of health area. Int J Sport Stud Hlth. 2017;1(1). e64335. doi: 10.5812/intjssh.64335. 12. Zeinalian R, Farhangi MA, Shariat A, Saghafi-Asl M. The effects of Spirulina Platensis on anthropometric indices, appetite, lipid profile and serum vascular endothelial growth factor (VEGF) in obese individuals: Arandomized double blinded placebo controlled trial. BMC Complement Altern Med. 2017;17(1):225. doi: 10.1186/s12906-017-1670-y. [PubMed: 28431534]. [PubMed Central: PMC5399840]. 13. Nabilpour M, Mayhew J. Effect of peripheral heart action on body composition and blood pressure in women with high blood pressure. Int J Sport Stud Hlth. 2018;1(2). e81874. doi: 10.5812/intjssh.81874. 14. Jorge ML, de Oliveira VN, Resende NM, Paraiso LF, Calixto A, Diniz AL, et al. The effects of aerobic, resistance, and combined exercise on metabolic control, inflammatory markers, adipocytokines, and muscle insulin signaling in patients with type 2 diabetes mellitus. Metabolism. 2011;60(9):1244-52. doi: 10.1016/j.metabol.2011.01.006. [PubMed: 21377179].